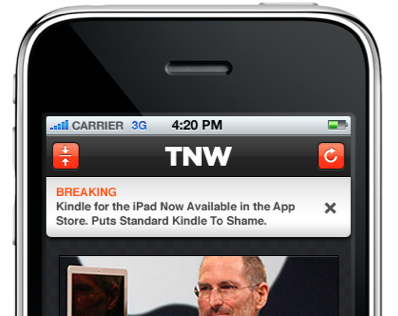 Many web content publishers are grappling with the question of whether to publish mobile device specific apps. Although I remember a few of these for my BlackBerry a few years back, it seems to be that the iPhone that is becoming the platform of first choice for most sites. Publishers need to balance the cost of dedicated apps with the improved user experience they offer. In this post I’ll look at my perfect feature set for an app built around publishing existing web based content. If I can’t use the app to download and read articles while I’m off the network then I could just use the web site. I’m not fussed whether this is in the application or through integration with services such as Instapaper or Read it Later. This one’s quite straightforward – I want to bookmark my favourite articles for later reading. Ideally, favourited articles would be downloaded for offline availability as well. If I find content I like I want to share it. The app needs to make it easy for me to share a link, including some commentary, on the platforms of my choice. As a starting point, Twitter and Facebook must be options. LinkedIn, Posterous, Blogger and WordPress would also be handy. Again, I’m not fussed whether this is in the application or through integration with other apps. We all like things to look nice. Put in some fancy graphics in and a few animated transitions. As long as it is not at the expense of the application’s speed and readability. A lot of these features have already been delivered on most platforms. The most obvious examples are sharing (Twitter clients) and offline reading (Instapaper, etc.). Build connectivity to other apps which already do whatever it is that they do well. I want to read comments on articles and post my own. Be mindful that I don’t want to enter my name and website every time so let me store those somewhere in the app’s settings. Your site probably publishes a lot of stories / information. Ideally, you’re categorising, tagging or using some other sort of taxonomy. Let me access the content by category or tag – that means I much more likely to weed out what I’m not interested. Or much more likely to find what I’m looking for. Sometimes I’m looking for something specific. Let me search within your app and I’m far more likely to use your content than if I Googled the same topic. I’m trying to say I trust your content more than I do Joe Website’s. Be flattered. I’d be surprised if your website isn’t running a Twitter stream. Perhaps you’re also sharing media via YouTube, flickr or similar. Let me see that from within the app. If you’re really savvy you’ll also allow me to see related content based on hashtag searching of keywords. People are interested in what other people are interested in. Twitter is a great example. Show me what stories are most popular on the site at the moment. I might have a story you don’t know about. Let me tell you. I’d love it if the app could download a selection of articles every morning without my intervention. Let me have all new articles tagged with “social media”, or all articles trending at 06h00. Download them without me needing to do something and I’ll have something to read on the tube. I don’t want separate identities on my phone and on your site. If I’m favouriting on the mobile, carry those over to my account on your site. Same for comments. Or settings. Let me flag articles online to be sent to my mobile. I like to read a few articles at night, when I’m lying in bed and I hate having to hold the mobile at 90 degrees to get the screen as I want it. Okay, maybe this one’s not fair. Everyone needs to put a bit of bread on the table and, frankly speaking, I have patience for a bit of advertising as I’m not paying for the content. But be sure that it doesn’t overwhelm me. There’s not much space on a mobile screen and if a third is dedicated to ads then I’m not going to bother with your application.